For those tight on time, this 75-minute Seine River cruise is perfect. Discover Paris' glittering waterfront sights in a relaxed, casual setting, and enjoy dinner with a view. Board a boat on Ile de la Cité, the epicenter of Paris, and cruise past Notre Dame Cathedral, the Louvre, Place de la Concorde, the Eiffel Tower and more famous attractions. Savor a simple 3-course meal from the comfort of your window-facing armchair, and upgrade to include wine or Champagne. 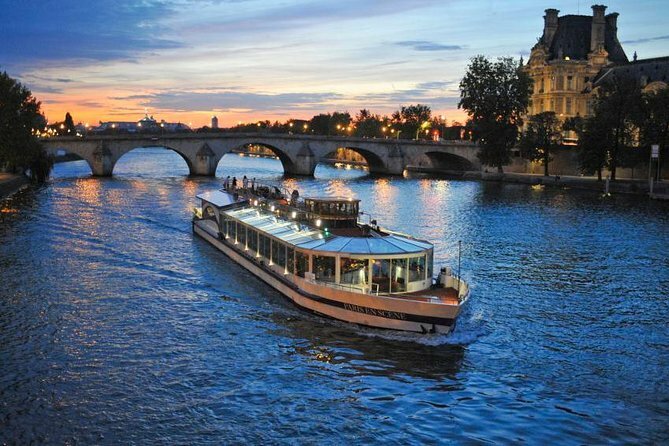 Board an elegant boat on Ile de la Cité, the historic heart of Paris, and head out along the River Seine to enjoy dazzling views of the city at night. This 75-minute cruise takes you past Paris’ most interesting and beautiful riverside attractions, and with your information booklet to hand, you can read up on them all from the comfort of your table. As your captain guides you gracefully along the river, keep an eye out for other special points of interest; Hôtel de Ville, the Louvre Museum, the Musée d’Orsay, Place de la Concorde and the dazzling Eiffel Tower all line your route, and your vantage point affords you wonderful viewing angles. As Paris’ nighttime panorama drifts by, enjoy a lovely 3-course set dinner: start with foie gras, followed by a fish specialty, and end with a duo of sweet treats. Upgrade to include wine or Champagne with your meal. The boat's armchair-style seats all face outward, ensuring amazing views as you dine. After 75 minutes of cruising the Seine, disembark at Ile de la Cité, where your tour began. The view along the Seine was impressive. The boat arrived at the pier 5 minutes before we set off. We were not sure we had the right location as there were no signs to indicate that the company docked in the middle of a bridge. The meal was pleasant. While a dinner cruise on The Seine sounds romantic this is definitely not. Maybe I expected too much. You board the boat and are seated you wait until all guests are boarded before seeing a server. I had gone to the bar even to order our table a round of cocktails and was told to return to my seat and someone would be with me momentarily. So you sit listening to outdated music that is not jazz, or French standards (or even standards at all) but 70's (not disco but far from dinner music).After about 15 minutes (from being seated) finally someone shows up to hand you a menu (a choice of 2 entrees) everything else is pre-set and still have not been offered a drink. Upon receiving the menu we requested a pre-dinner cocktail it was finally served when the appetizer was served by the waiter. As the boat started to travel the lights allowing the staff to see (understandable) were reflecting in the window glass making more of an impression and dimming the view of the Eiffel Tower which was fully lit. Making picture taking near impossible.The food is prepared off site and appears to only be plated on the boat, food is little more than airline food on a plate.The waiters (possibly understaffed) since you only see them when passing out food or collecting dirty plates do not have time to give you "real service". While trying to take pictures I was told I could go to the upper deck and get a better picture but I was worried if I did I would miss the server as they strolled through picking up plates or distributing the next course.The cruise lasts approximately 90 minutes and by the end I was ready to get off.Some things they could do to make the experience better. Have servers ready to attend to customers as soon as they board for pre-dinner cocktails, change the music to a little more "French" inspired, dimming of the lights or a different kind where you have an unobstructed view of the sites. I do realize this is a "tourist" venture (as everyone in our seated area were tourists) but with a few "tweeks" could have been so much more.Personally for the length of this cruise I would have preferred a pre-dinner cocktail cruise, board us have a drink or two down the Seine and then disembarked and went somewhere else for dinner. Would this have been better had I taken the later cruise? Maybe, or maybe at another time of the years when the sun sets later so we could have been here at dusk. Will I go again? Probably BUT will do some homework to see other options.